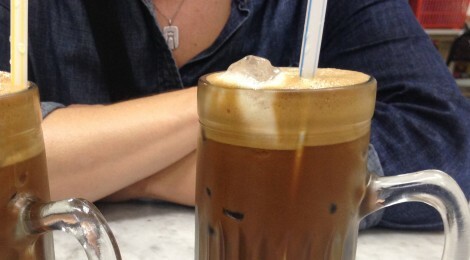 Europeans might debate: is there coffee in Malaysia? 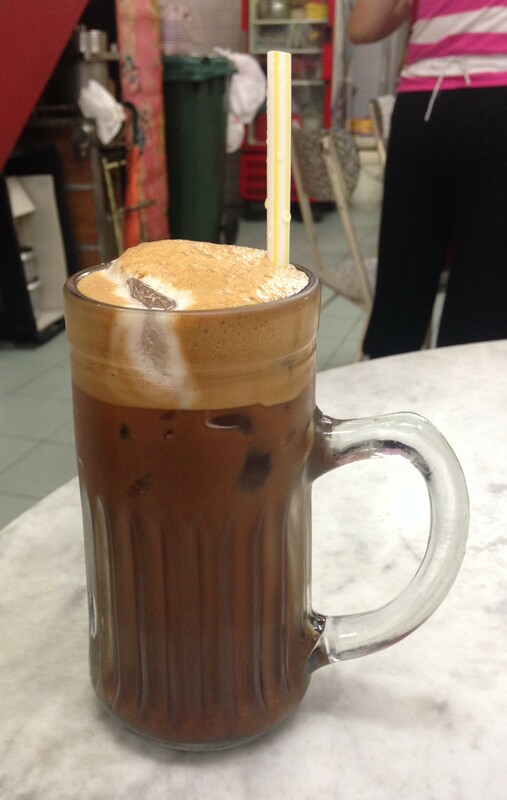 Southeast Asians might debate: is there a Malaysian style of coffee? Food adventurers and java junkies might debate: is there really anything to what’s called Malaysian white coffee? If so, what is it? 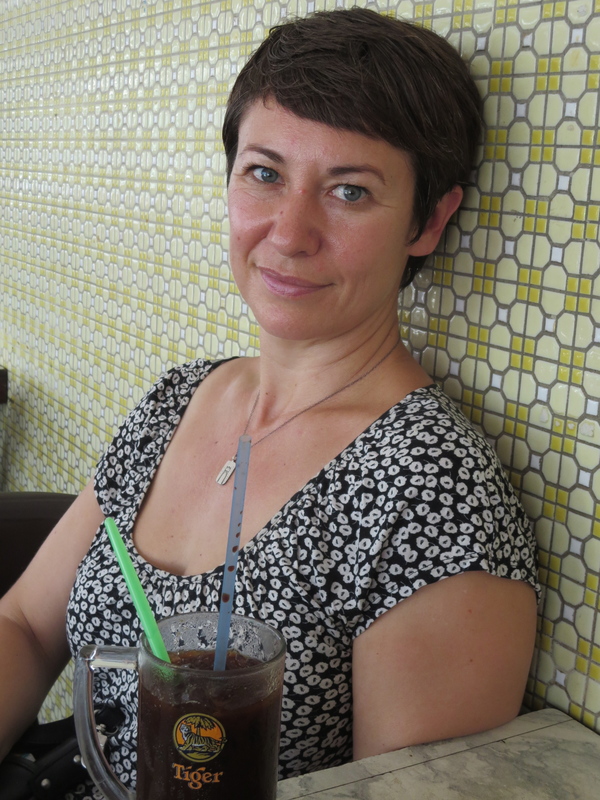 Alison and I might debate: where’s the best coffee in Malaysia? 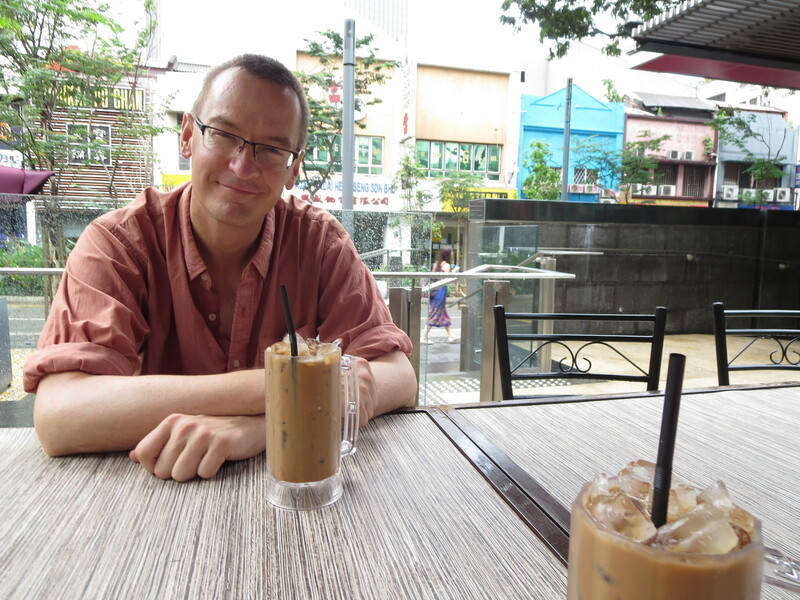 Please allow an American to settle a European debate: yes, there is coffee in Malaysia. It may be sweeter and colder than the Europeans recognize, but the Malaysians (and the Thais) and Starbucks and have made it definitive. Dessert coffee is still coffee. Pump it full of sugar and pour it over ice, it still uses the same bean and delivers abundant caffeine. Speaking of dessert coffee: this is called a Three-In-Love. The bottom layer is a thick date-sugar syrup with some coffee essence; the middle layer is sweetened condensed milk; The top layer is Malaysian coffee. Yep, that’s a maraccio cherry stuck in the middle. We ordered it because of the name, not because we knew what was in it. The two bottom layers were so sweet we couldn’t tell if the coffee was sweet. Click the photo to enlarge. Is there a coffee style unique to Malaysia? What we can say from personal experience is that traditional brewers in the small restaurants and street carts of Thailand and Malaysia use similar looking beans, similar looking filters, and Carnation canned milk products that probably come from a single Nestle factory. The result of my research says that there is no special bean, no cultivar or—if you will let me lean on a French term—terroir that justifies a special Malaysian designation. A bit more than 95% of coffee grown in Malaysia is the Liberica varietal (Yes, you read that right, not Robusta, not Arabica. ), introduced to the country in about 1875. And Malaysian coffee production is small, roughly 10,000 tons. Could it be something else? A process perhaps? Ah ha! We are on to something. Pause for a moment, while we raise our mugs and plastic bags (Cold Malaysian coffee to go is sometimes served in plastic bags, with a straw protruding from the top.) to the inventiveness and preferences our fellow humans. Today, from the shores of Penang to the border with Singapore and, yes, in Singapore, “Ipoh white coffee” or “Malaysian white coffee” or more simply “white coffee” is heavily marketed. Is white coffee really cooked in margarine? How does it taste? The white coffee at Jit Seng Duck Rice. The waiter tried very hard to sell us beer, but we were not deterred. Glass mugs are definitely the most common table service for iced coffee–nobody seems to care what’s written on the side. Click the photo to enlarge. There’s no easy way to tell if everything that’s labeled “white coffee” has had the all-margarine, no-sugar treatment. Coffee writers expect there is some bait-and-switch going on because using margarine adds to production costs, as does removing the grain. It’s easy to imagine a flinty-eyed businessman barking orders to his subordinates, “Call it the expensive kind, but put cheap stuff in the package!” Ah, capitalism in the absence of ethics. How does white coffee taste? 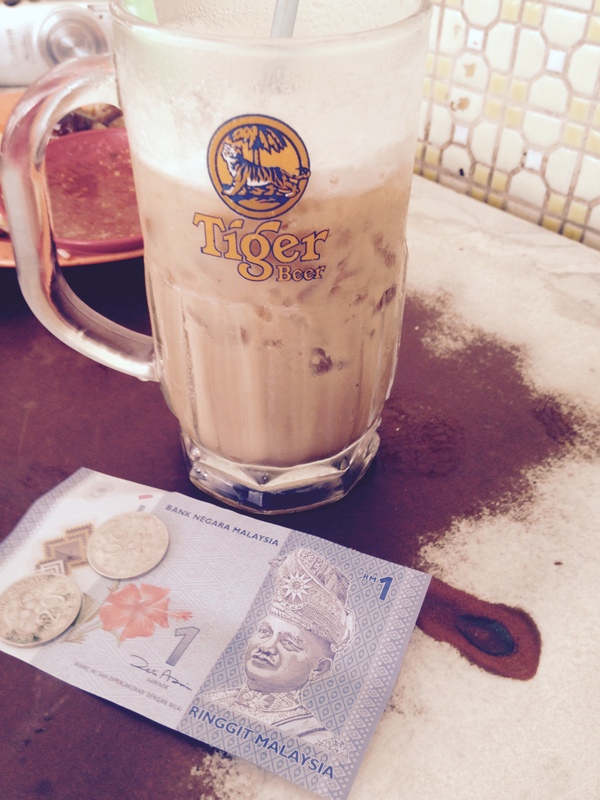 I had our one-and-only white coffee in George Town. Was it sweet? Was it milky? Of course, that’s the Southeast Asian serving style. 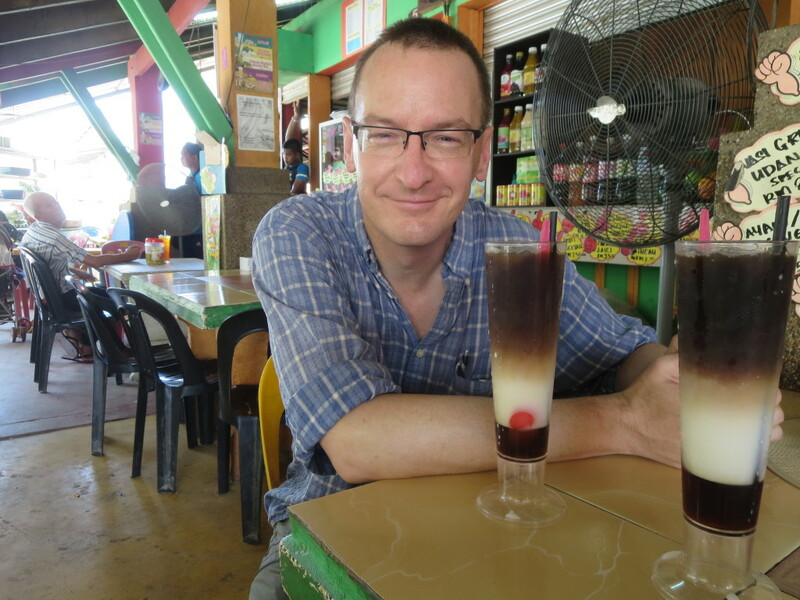 And…the color of the beverage in my glass was distinctly lighter than any other coffee beverage we were served in Malaysia, no matter how sweet it had been made with sugared milk. The taste had a distinctly caramel side. It was nutty, too, without offering recognizable almond or hazelnut or macadamia. A new color? A new flavor profile that wasn’t a direct copy of something familiar? Those are indicators of a unique process. I trust that the tall, thin, Chinese-descended beverage man at Jit Seng Duck Rice served real white coffee. Ipoh white coffee? Pale, tasty, unusual, noteworthy, enjoyable. Real. Why trust the tall, thin, Chinese-descended beverage man at Jit Seng Duck Rice? Because he is a savant of coffee and from the first glass (our first wasn’t his white coffee) he got himself in the daily debate: where’s the best coffee in Malaysia? 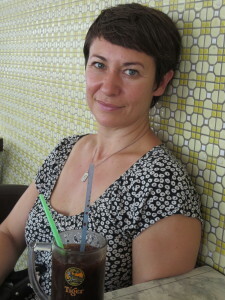 Alison with her favorite Malaysian coffee, the oh-so-chocolatey kopi at Jit Seng Duck Rice. Unlike a mocha, we think this coffee hasn’t been within a mile of chocolate. We suspect its all in the roasting of the beans. Click the photo to enlarge. You’ve probably noticed. All of these places are, ethnically speaking, Chinese. Our tastes prefer the bitter element that, in one of the local dialects is pronounced kaw (Sorry, I don’t know the Chinese character that’s used to write the idea.). Alison and I had no trouble at all agreeing on the top three, but there our agreement stops. Our savant at Jit Seng Duck Rice produces (We watched him brew, but we don’t know if he roasts his own beans.) a mugful that is darker than most and has very strong chocolate notes. That’s Alison’s favorite. My personal favorite in the Malaysian coffee debate: a late afternoon mug at Sin Hoy How. Such tall froth! And a two-tone froth! Yes, around the ice cube and near the right edge it’s pure, milky white. How do they do that? Click the photo to enlarge. We made multiple trips to Yut Kee and not just because it was in close proximity to our hotel, or because they make the very best fried chicken cutlet with gravy in their hemisphere. The iced coffee is superb. Did we go back because theirs was the most balanced? Or does the even flavor put them in third place? My favorite was at the hidden-in-plain-sight Sin Hoy How, whose coffee had the most unique bitter flavors, was lighter in color, and had an amazing froth on top. The operation started as a corner café (The slightly more sophisticated Malaysian idea is the kopitam.) and then became a wholesale roaster, keeping the kopitam in operation for more than 80 years. For me, their brew succeeded at creating something absolutely Malaysian…it sidestepped the New World profile of chocolate with a flavor that left me feeling like I’d sipped a shadow puppet: I could not mistake its intricate beauty and clarity of outline, yet a screen of mystery is key to its essence. This post is specially dedicated to my colleague Bruce Harrington, who is a masterful micro-roaster. If you want to do your coffee palette a wonderful surprise, I will happily put you in touch with Bruce and you can try a pound or two of his best work (I can also attest to how well he does his other work as an embedded systems programmer. ).